The fitness tracker market is now so congested that it’s tough for new devices to really stand out from the crowd. In this Microsoft Band 2 review article you will see that with its sheer number of features and ease of use, the Microsoft Band 2 manages to do so, with a few qualifications that most fitness fans won’t need to worry about. For runners, the Microsoft Band 2 has been one of the most impressive recent trackers that we’ve some across. One of the fundamental strengths of the Band 2 is its GPS hook-up, which allows runners to precisely track their movements down to the yard. The GPS tracker has a formidably high level of accuracy in comparison to other trackers in the same class, making this the ideal option for marathon runners who are serious about their training schedules. 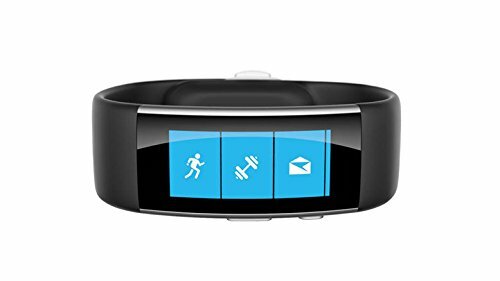 If you would like to analyse your triathlete training you should look for a different fitness band because Microsoft does not recommend to go swimming with the Microsoft Band 2. This new band from Microsoft improves on its earlier version considerably. For example, the Band 2 includes an innovative UV sensor and the barometric sensor can tell how many floors the wearer has climbed. Features like this show the attention to detail involved. Microsoft have tried to make this a tracker that can help everybody to improve their general health, while remaining powerful enough for genuine athletes. Conventional sensors include things like continuous heart rate monitoring, ambient light and skin temperature detection, and should deliver the capabilities that most athletes need. As far as we could tell, the readings were accurate and stable, without the volatility that is characteristic of poor quality devices. So you should be able to trust the Band 2 to generate useful data. We liked the online dashboard function as well, which brings together all of the features on the Band 2. Using this tool, it’s easy to create custom work-out schedules with the right metrics, so that you can chart your progress and stay on schedule. Another step forward has been connectivity. We found that you can easily hook the Band 2 up to your iPhone via Bluetooth, not just Windows Phones. The display is a brilliant curved OLED display made of Gorilla Glass 3. Furthermore, call alerts, emails, calendar updates and social updates will be directly shown on your wrist. In terms of wearability, the Band 2 represents a huge step forward for Microsoft’s fitness team. Its soft, silicone based materials are light and comfortable, even on long runs. Compared of the original Microsoft Band, which was clunky and often a little uncomfortable, the Band 2 offers a big improvement. It has a curved design that fits the shape of the wearer’s arms and the silicone is extremely flexible as well, making it easier to slip on and off. There’s no doubt that the Band 2 is an impressive product, and we recommend it for all levels of athlete. However, it’s worth noting in our Microsoft Band 2 Review that the battery life can be variable, although 48 hours is still perfectly usable. If you need tailored work-out schedules, it also might not be the best tracker on the market. We were surprised that it didn’t link into networks like Facebook as well. Social media and fitness tracking seem like a natural fit, and we expect Microsoft to head in this direction in the future. The Microsoft Band 2 is an impressive product! Despite these minor issues (and they are really very small criticisms), the Band 2 from Microsoft offers a range of tools that can benefit anyone who keeps to a tight work-out schedule. It’s a comfortable, simple to use and powerful tracker and is easily in the first rank of its class. Size Medium fits wrists 6.4"-7.4"